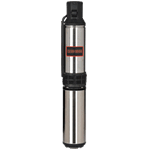 Shallow well pumps are found in applications of 25' or less. This style of well pump is not submersible and is placed outside the well in a well housing. A feature you should look for is overload protection, which prevents motor burnout. The best shallow well pumps are accompanied by a tank or a booster to increase PSI, which provides constant water pressure to your home. 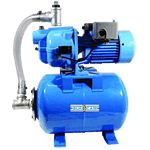 If size is a restriction due to your well housing, choose a pump with a booster as this will take up less space. Deep well pumps can be used in wells as deep as 90 - 300' below ground. Unlike shallow well pumps, deep well pumps are submerged inside your well. Considering these pumps can be several hundred feet below ground, a 3-wire model makes maintenance easier. This is because the starter controls are above ground, wired to the pump. a 2-wire model is easier to install, but should the pump fail, you'll need to bring it up to ground level to fix it. Convertible well pumps can operate between 0 - 25' with a shallow jet well nozzle or between 25 - 90' with an ejector assembly. These pumps are not submersible and are situated in a well housing. 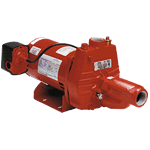 These pumps are popular with people who have a fluctuating water table. The jet portion of the pump, otherwise known as an ejector, has the primary function of increasing pressure to help draw water from a deeper depth. The pump works by creating a vacuum in the suction pipe and relies on atmospheric pressure to force the water from the well to the pump. Well Pump Buyer's Guide - Find Out How to Pick the Perfect Well Pump. Our water pump how-to library can help you pick the perfect dewatering pump, submersible pump, trash pump or water pump accessory.